Buying locally is a big part of living sustainably – both for us AND our community. Lowcountry Local First is asking local residents to take the 10% Shift Pledge and start buying more from local businesses. The goal is for local businesses, organizations, and families to shift an additional 10% of their annual spending to local businesses. And based on the results of our polls, buying locally is already on everyone’s mind – now it’s time to commit! 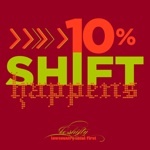 Come down to the 10% Shift Launch Party on July 10th at the Navy Yard at Noisette to begin the shift. Great food will be on hand, info on how to buy locally, and the cost to get in is only 10 cents!